Living On The Border, Driven — Literally — Underground After living underground in the United States — figuratively speaking — some undocumented immigrants deported to the Mexican border city of Tijuana have been driven — quite literally — underground. They're living in holes along Tijuana's fetid sewage canal for protection against police. After living underground in the United States — figuratively speaking — some undocumented immigrants deported to the Mexican border city of Tijuana are living in holes. These migrants have dug bunkers along Tijuana's sewage canal to protect themselves from police who routinely burn down their makeshift homes. 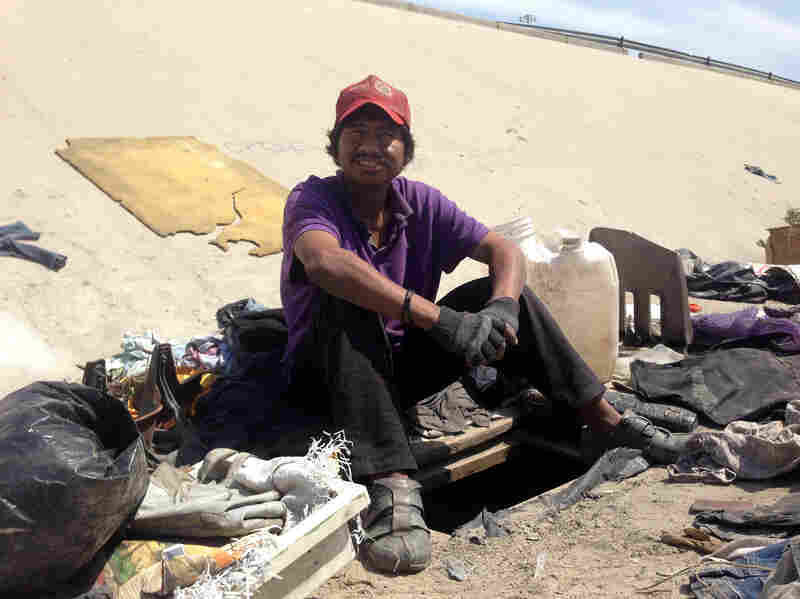 Abimael Martinez, who was deported from Riverside, Calif., sits next to the hole he dug to live in beneath the banks of Tijuana's fetid river canal. The Tijuana River is lined in concrete and cuts through the city for miles, draining sewage and runoff. Human feces litters the banks, trash swirls around in sudsy eddies and a dead dog occasionally floats by. It is estimated that between 1,000 to 3,000 people live along the river, many of them deported from the United States, like Abimael Martinez. Martinez stands over a hole he dug; this is where he lives. The riverbed hasn't always been home. Martinez owned an auto body shop in Riverside, Calif., for eight years. He went to church, had a girlfriend and was like a dad to her kids. But two years ago, he was deported for driving without a license. So he's homeless in the Tijuana canal and has fallen into the cross hairs of the police. The authorities think deportees are vagrants and criminals, and sweep through the river canal to flush them out. "A policeman took my backpack and threw it in a fire when they came and burnt our stuff," he says through a translator. After that, Martinez began to bury his belongings for safekeeping. That worked well, so he made himself a hole to live in. Martinez has reinforced the walls with wood that he collected at building demolition sites around the city. He brags that a police truck rolled over a few days ago and it didn't cave in. Inside, there's no room to stand up. The space is about as big as two refrigerators laid side by side. Martinez made a lid for his hole from a Styrofoam cooler. When the police come, he pulls it over the entrance. It lies flush with the riverbed and looks like just another piece of trash. The U.S. government has returned hundreds of thousands of people from the U.S. to Tijuana since 2009. That includes a combination of people formally deported and those caught and returned the same day. In fact, more people have been removed to Tijuana than to any other Mexican border city. Tijuana's police chief, Alberto Capella Ibarra, says deportees have become the city's No. 1 problem. "It has social repercussions, repercussions in the city's image because it's people that look like they don't have anything to do wandering around the city," Capella says. Many deportees stay in Tijuana because they consider the U.S. home. They want to cross again — or at least feel close to their families there. But beefed up border enforcement means deportees are bottled up. That's why hundreds live in the fetid canal, in drainpipes, even in trees. Capella blames these people for crime, especially, he says, the ex-convicts who served time in U.S. prisons. "What are we going to do? Cross our arms and hope that the problem resolves itself? Or do what we need to, assuming the risk that one of us could go too far?" he says. Capella has been criticized for violating deportees' civil rights. He says it isn't police policy but may happen in the course of keeping the peace. The number of people removed to Tijuana actually dropped to a historic low last year. Of those U.S. Immigration and Customs Enforcement sent home worldwide, fewer than 0.3 percent were murderers. Many had no criminal record. Nevertheless, blaming deportees for crime has caught fire among Tijuana's leaders. "We can't think that all migrants are criminals," says Father Ernesto Hernandez Ruiz, who runs the Padre Chava soup kitchen in downtown Tijuana. Twelve hundred people eat breakfast here every morning. Father Hernandez says the vast majority are deportees. Many live in the river canal, like Martinez. "For the police in Mexico, just seeing someone dirty and disoriented like that is enough to detain them," Martinez says. Hernandez says for deportees, it's a quick slide into desperation. Back beneath the riverbank, Martinez sorts scrap metal to try to make a few pesos. He saves the nails because he's remodeling. "People have begun dropping their backpacks off with me for safekeeping before they go to work. So, I want to separate the drop-off space from the bed," he says. Martinez says he's proud of his ingenuity. "It sets an example and a lot of people are building now," he says. Martinez estimates he's seen at least 25 people digging recently. He says they all hope to get out of their holes soon and cross back to the U.S.